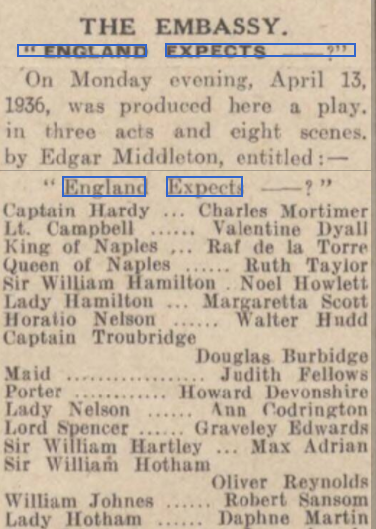 Charles Mortimer played Captain Hardy in "England Expects....", at the Embassy Theatre, London, in 1936. Article from the Yorkshire Post on 14 April, 1936. From The Stage - Thursday 09 April 1936. 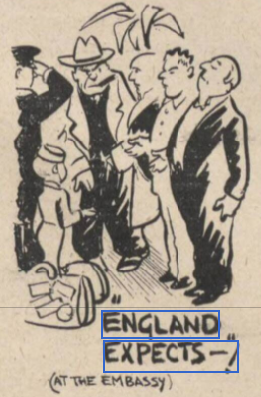 From the Coventry Evening Telegraph of 9 April, 1936. From The Stage - Thursday 16 April 1936. From The Aberdeen Journal, 14 April, 1936. 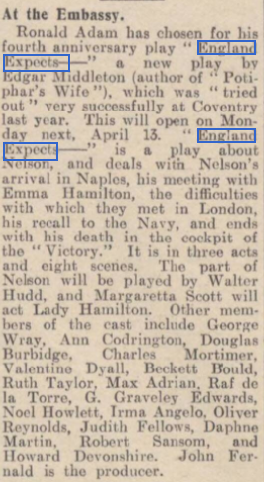 Lord Nelson and his relations with Lady Hamilton form the basis of a new play by Edgar Middleton, "England Expects" which was presented for the first time at the Embassy Theatre last night. The author makes no attempt to gloss over the illicit partnership of the two, beyond claiming that what brought them together in the first place was a mutual desire to overcome the French in the Mediterranean. Walter Hudd who plays the Admiral, suggests the character of a great naval commander who in his private life was something of a cad. The scene in which Nelson insults his wife in front of his mistress is one of the best written in the play. 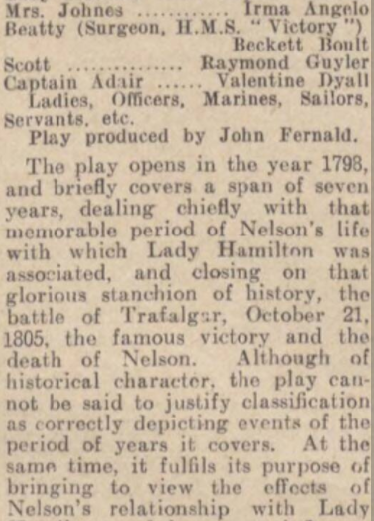 The drama is somewhat slow, but the, finale on the Victory at Trafalgar is strongly done. 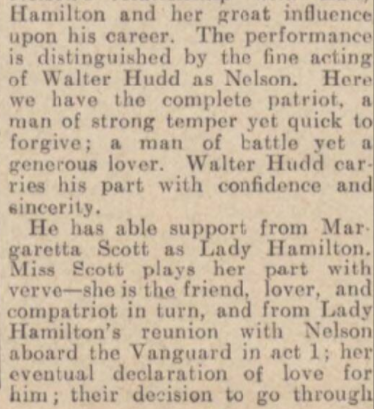 Margaretta Scott as Lady Hamilton acts as a sort or robust Nell Gwynne and though she does not neglect the somewhat common bearing of Emma, does give the impression of love for Nelson which will stand up to the voice of public opinion. From The Era 15 April, 1936. ... Noel Howlitt's Sir William, Charles Mortimer's Hardy, and Douglas Burbridge's Troubridge, were very well done indeed. 14 April, 1936. With kind permission of the Times.